Back on Day 207, I watched the NFL Draft for the first time and was completely annoyed that I lost hours off of my life watching such a gross display of arrogance and wealth. I vowed to never get involved in such a charade again. Unfortunately, all my attempts to stay away from overly dramatized, emotionally charged professional sports decision making were unsuccessful when all anyone could talk about was LeBron James becoming a free agent and whether or not he would leave the Cleveland Cavaliers for another team. I'm not really much of a professional sports fan period, and of all the professional sports out there, I enjoy basketball the least. So I tried to ignore the seemingly endless LeBron "Will he stay or will he go?," nonsense, certain that it was a bunch of chatter from another professional athlete who makes too much money. But I, like the rest of the world, couldn't help but pay attention. And on Day 284, when I found myself at home on a Thursday night with nothing else to do but watch television, I tuned in, as the thing I've never done before, to watch LeBron James' "The Decision" special on ESPN. This hour and fifteen minute long special, that drew 9.95 million viewers, is in my opinion, what's wrong with people (myself included) and with America. While watching, my mind darted through a laundry list of questions: Is this guy serious? Is ESPN serious? Why are you watching, Stephanie? Aren't there more important things you could be doing? Is this guy so good that an hour (and 15 minutes) should be dedicated to where he plans on playing next year? In typical hyped up TV special fashion, it took 22 minutes of build up until ESPN anchor Stuart Smith actually, "turned [the terrible] program over to Jim Gray, who was with LeBron at the Boys & Girls Club in Greenwich, Connecticut. What? Why is he in Connecticut? There are no basketball teams there. 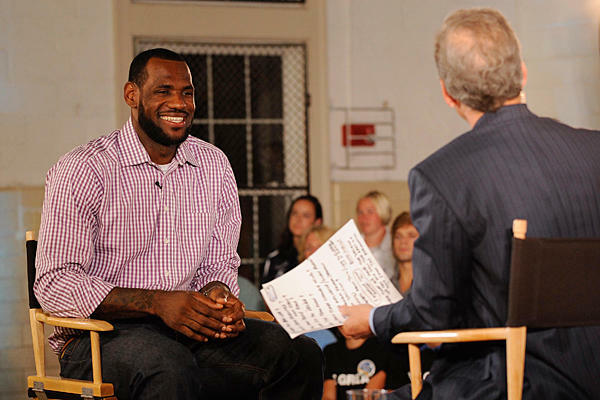 Jim Gray, forced to take even more time from my precious life, proceeded to ask LeBron a lot of really stupid questions. When did you decide? How many people know what your decision is? Do they know that they know what your decision is? Do those who don't know what your decision is know that they don't know what the decision is and how you arrived at this decision? "Come on already!," I wanted to shout at the television. And then LeBron said it wasn't until he spoke to his mother that he actually made the final decision. I paused long enough to consider that was sweet, and I'll bet his mother appreciated it. Then I thought I should probably call my mom. At 9:27pm, after what felt like hours of nonsense, LeBron James announced that he would leave Cleveland to, "Take his talents to South Beach and join the Miami Heat." That one statement infuriated the citizens of Cleveland, and made folks in Miami jump for joy. I know, because I saw people burning LeBron James' jerseys for weeks on the news in a split-screen next to dance parties outside Miami bars. How does this one guy have this much power? Because we allow them to. We (read: I) bought into that display hook, line, and sinker, along with the other 9,949,999 people in this country. Disgusting. So for an experiment, I have decided to tell you all that I'm going to end the blog in Atlanta, and I'm going to take my talents elsewhere. What? No response? No fury? No excitement? It's okay not to care THAT much. That's the way it should be. Side note: A few days before Day 284 I accidentally bought waterproof mascara, which, in my opinion, is one of the most annoying accidental purchases one can ever make. I end up either tearing my eyelashes out individually in an effort to take it off, or just wearing day-old mascara everyday like I shacked at a fraternity house. So . . .while watching "The Decision," I decided to try an at-home recipe for taking off waterproof mascara. Olive oil. It works. Finally, a good decision. I HATE WATERPROOF MASCARA. Nightmare.